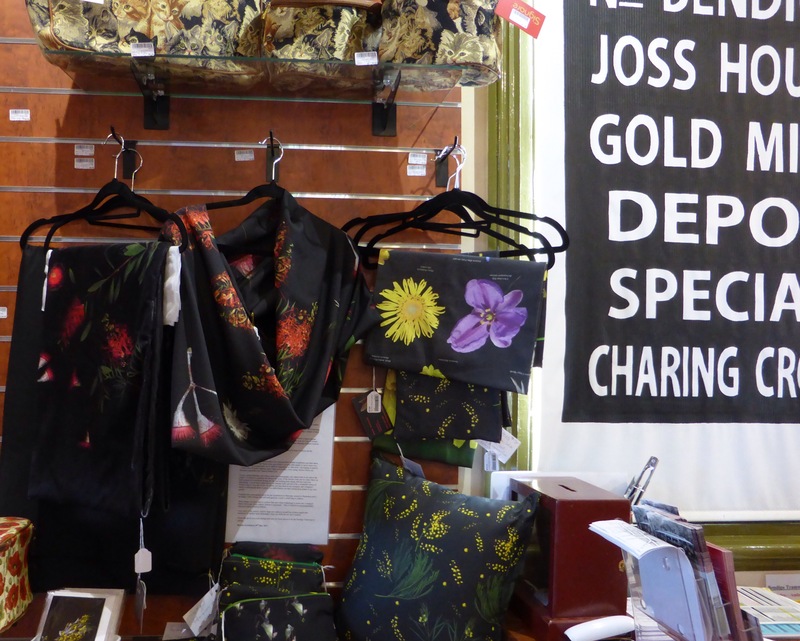 The Bendigo Tramways stocks my wearable art pieces, ranging from scarves to zippers bags to cards and cushions. They all have in common the fact they started with my photographic art featuring local FLORA AND FAUNA here in Bendigo and district. With thanks to Belinda for her encouragement and support! I have loved gardening for as long as I can remember; a passion I inherited from my mother. I have loved photography ever since getting a Kodak camera at the age of ten. So combining these two passions into creating beautiful floral art seems to have been only a matter of time and developing the skills to do so! In 2016 I took my floral art into a new realm by venturing into the world of fabric design, bolstered by the confidence gained when I was given a small grant from the City of Greater Bendigo to design and create fabric shawls to feature in the annual Bendigo Fashion Festival parade. 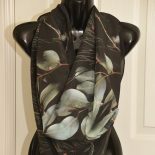 There are two themes to my fabric – the native flora of Central Victoria and the suburban flora of Bendigo, with a strong desire to show the fragility as well as beauty. Creating each has its challenges. For example the suburban flora needs to be collected from helpful neighbours and then taken back to the studio, set into florist foam and styled to an array that speaks to me in some way. How to light the arrangement can be difficult depending on what look I am hoping to achieve – I use a mix of studio lighting, speed lights and torches. I love using various lenses, my favourite is probably the Tamron 90mm f2.8. For my current Bendigo native flora series the photographs were taken both in situ and in the studio. I would have preferred the former but many of the flowers were out at a time when we had a plaque of mosquitoes during the day and battling them along with the wind was frustrating. A local native plant nursery in Maiden Gully proved to be a wonderful source of flowers where I was able to buy the plants and take them to my mosquito and windproof studio to photograph them in peace. An added bonus was then seeing these plants in my own garden. Creating these photographs gives me the foundations to then play around in Photoshop until I am happy with a design that will look good as a scarf or small bag or cushion. These images are then sent to a printer that uses inkjet technology to print onto a range of fabrics that range from organic cottons to polyesters. This is I believe an environmentally conscious fabric printing method. I sew most of the scarves, shawls, bags and cushions myself. 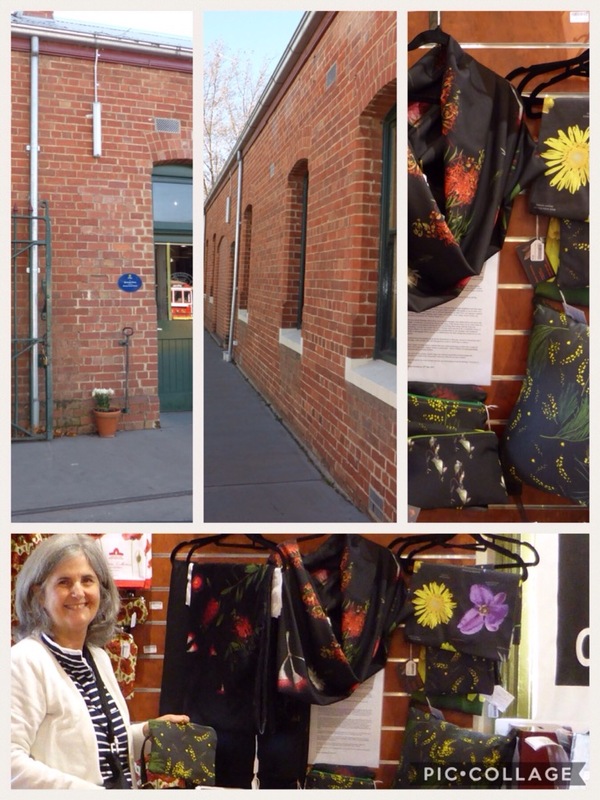 I hope this gives you some background into my floral pieces of art the Bendigo Tramways is selling. I am new into wearable art also watercolor patterns> I love this helpful post. This entry was posted on June 11, 2017 by sharongreenaway in #sharongreenaway and tagged art, bendigo, environment, fabric, flora, fragile nature, indigenous, photography, suburban, tourism, tramways.